I have to say, the word press community is really incredible for getting/sharing ideas from/with many different people in many different life situations and locations. I think it’s also the fact that I can “follow” people who usually have much different views than I do, and even if I don’t always agree, I can broaden my horizons a bit. 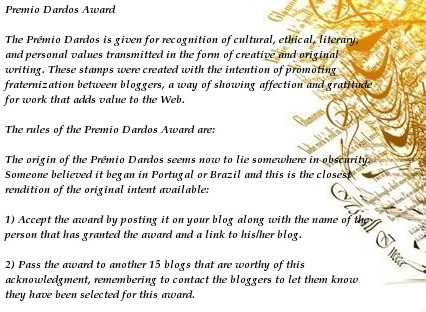 I guess my writings reflect that, and I guess that’s why I’ve been nominated for the Premio Dardos award by marjma2014, writer of a beautiful blog about writing and reading – two of my favorite pastimes – Kyrosmagica. Thank you! The Traveling Trini (who most recently wrote about homophobia in Trinidad and Tobago), The Classic Cosmopolite (most recently posted a helpful set of tips for traveling on a budget), Foreign Sanctuary (recently posted a few funny stories of her relationship with her Taiwanese husband), Storytime with John (most recently posted about an escapade in his kindergarten class in South Korea), India and Society (some critical pieces of Indian society), Glittering Wanderlust (usually posts some great photos of her adventures abroad, recently finished a semester in Spain), and Adventures Across Borders (who wrote a really good post on cultural self-awareness). I encourage you to check them out! Aging Runnah, the blogger of Mice Notes (really neat mice comics of anything from university work to opera to Benedict Cumberbatch). BlissfulBritt (coffee and chemistry), Walk to Rio 2016 (he says his main goal it to make it to the 2016 Olympics in speed walking, but I think he likes to make everyone have a good time while he does so. A lot of really great European city exploring goes on to), and 2write4health (this one really gets me thinking about what I eat in a non-judging reasonable way- plus she always has great recipes!). If you want, please accept my nomination by answering these 7 questions! they’re from marjma2014 . I hope she doesn’t mind. Then, you get to nominate some bloggers too. Do you have any unusual pastimes such as pot-holing, or ball-room dancing? What kind of books do you like to read, and do you have a favourite? If you had a choice to listen to a music concert, go to a film, or the theatre, or an art/photography exposition, which would you choose? What is your favourite and your least favourite food? I was humming along through my third semester of MA studies, getting together application material for continuing studies at schools in the U.S. and Germany, and I then I find out something that shifts the trajectory of my life a bit. This shift has to do with difference between PhD applications in Germany and in the U.S. In Germany, the value of one’s MA degree (the GPA) determines entry into a PhD program. This makes sense, I guess, since the application officials want to be sure one knows what the heck one is doing, the officials have quantifiable information about the applicant, and there’s no danger for MA senioritis and having accepted students who don’t end up completing their MA studies. (why don’t we consider that in the US?) In short, in Germany one may not apply for a PhD until the MA is completed. On the other hand, in the U.S., students in their last year of MA studies are already applying for PhD programs. I remember sitting in my Spring courses and congratulating fellow MA students (who had just submitted their theses) for being accepted to programs in California, New York, and Chicago. I can still apply for U.S. schools, but since being in Germany, I am convinced that this is where I want to continue my studies. But I can’t apply by Jan. 5th 2015; rather, I wait until Jan 2016. What am I going to do with this unexpected gap year? Well, stay tuned as I figure that out myself. A week ago, I nominated five bloggers for the Liebster award in my own response to the nomination (thank you again Sara Bennet!). So far, none of the nominees have acted on the award and it makes me wonder if my questions were too personal, whether I showed bad blogging etiquette. This made me wonder if my experiences abroad and my inexperience in the virtual world has made me someone who fails to recognize the mental personal space of others. I haven’t been on social media platforms for a while, and so I don’t know anymore what sorts of things are shared on social media. I also am confused a bit by the wide range of things shared on WordPress- posts range from personal battles with cancer to accidents while running to dealing with the deaths of family members. On the other hand, I’ve also lost the feel for what sorts of things are shared “in real life” between people who don’t know each other. Since being here, I’ve been doing a lot of meeting people. Usually, these meetings are with other students, dorm-mates, professors, people waiting for the subway, etc. It’s bizarre how many times I’ve repeated my life story to people… come from U.S. America but speak good German because I was brought up biculturally, have been to Germany many times, studying comparative literature, writing my MA thesis, like to run… In the past month, I feel like I’ve spread my life across more people than this blog reaches, and yet I don’t see most of these people again. At the same time, there’s the desire to want to get to know others deeper, and in order to do that, one needs to take these first steps of introduction over and over again. So it’s all very confusing right now and I’m sorry if my questions seemed too personal or my own expressions on this blog seem too frank. I do actually censor myself while I write because I write with a specific purpose and an imagined audience in mind, and I think you should know that the person I present on screen is also not necessarily the one you would meet if you ever met me. It’s certainly not the person I am with my family, so I am aware that there are these fine lines of private and public… I just may need to be more clear about it after having been confused via my blog and since being abroad, and I’ll try to be a little more aware of that in the future. Yesterday, I was nominated for the Liebster Award by saraybennet. I can only put the link for her wonderful blog “Glittering Wanderlust” here and hope that you click on it and read at least one or two posts about her adventures abroad in Spain. Thanks for the nomination! So, let’s get started. First off, what’s the Liebster Award? When I first saw it, I had to think of the superlative form of the word “Lieb” in German. Liebster is a way to refer to your favorite… so I could start a sentence with “Mein Liebster Kuchen” and you’d be about to hear about my favorite cake. The award aims to expose new bloggers and help mark their blog in the blogging world. Nominate 5-11 bloggers who you feel deserve this award and who have less than 200 followers. 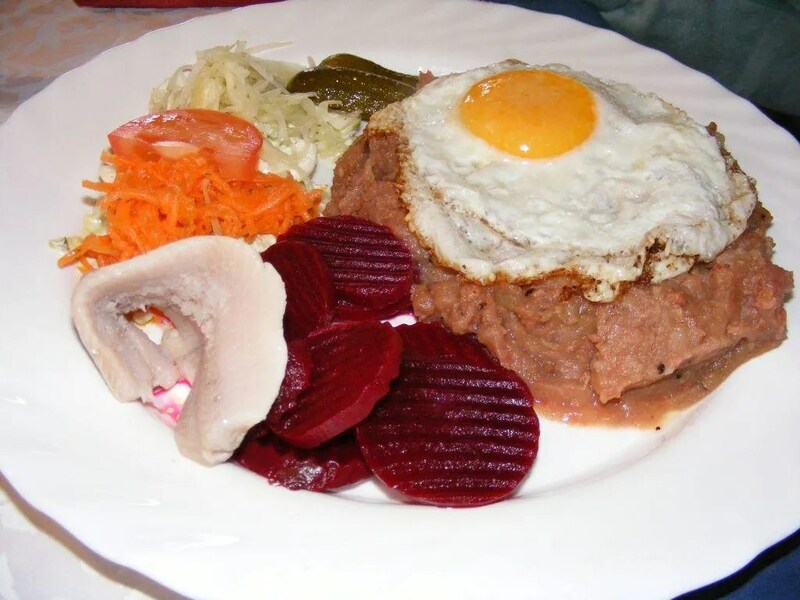 The mush under the egg, sunny-side-up is a mix of salted meat (can be corned beef), potatoes, and onion in beet juice. Then on the side one usually gets roll-mops (herring), pickled beets, and gherkin. A lot of salt and vinegar, the weirdest mix ever… but it tastes quite “not-bad.” I’d even go so far as to recommend it. Do you like solo or group travel better? I like being in transit solo better, but I enjoy actually being in a place better in groups. Would you ever go skydiving? If the opportunity presented itself, yes. What is your favorite book or movie? Right now, The Lord of the Rings books AND movies are occupying a lot of brain space, but I’m also enjoying Wir neuen Deutschen as well. I’d like to do a blog post about it soon. Now, instead of posting my facts about myself, l’m going to mention nominees and questions, and then answer those questions myself. I nominate Rural Running Redhead, pscapp, trying to get faster even as I get older, Cadence Runner and run fast, puke left for the Liebster award and to answer the following questions. I’ve asked them because they’re the folks (sorry, not sorry about using that word) whose response posts I (and maybe others) would like to read. How much did you run from Oct. 13-19? When you are ready to blog, do you make yourself a drink first? If so, what kind? What is something you would like to accomplish before the end of 2014? If you have children, which of your traits are you most happy that they picked up? If you (and anyone else you with you) were given a travel stipend and a week off, where would you go? Which language do you think sounds the most beautiful? What kind of movie would you like to star in? (for the laundromat-savvy) If there was one machine almost done, and you needed to do a load, how long would you wait for the person to show up before you (nicely) took out their laundry so that you could do yours? Do you blog with the hope that others read your blog, or do you really not care? All these questions are optional! Do [I] have a set time you try to blog, or does it just “happen?” I don’t have a set time, but usually do it when I’m not distracted by anything else pressing. Do [I] blog with the hope that others read [my] blog, or do [I] really not care? I do have a set audience in mind for my blog sites, and I do kind of hope that my posts get read. Yet in the end, it really only matters to me that I can go back and read them myself.